Refunds and Returns Orders may only be cancelled if the items have NOT been shipped to you. An order is not considered cancelled until you receive an e-mail from us confirming your cancellation (if the order ships before this confirmation is received the customer is still responsible for original shipping and return shipping costs). Once an item has been shipped, it may only be returned for a refund or exchanged for another product. The customer is responsible for ALL shipping charges (original shipping and return shipping) on returned and/or exchanged items. This also applies to orders that qualified for free shipping. If an item is defective, or you wish to return it, you must contact us within 30 business days of receiving the item. The following conditions apply to all returns, exchanges and refunds. Goods returned must be new, in original packaging, unused and in resalable condition and are subject to inspection. 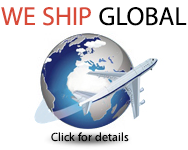 The customer is responsible for all return shipping costs on items being returned or exchanged. Refunds and/or exchanges will be provided once the item has been received in its original condition. The refunded amount will be what you paid for the item being returned only. We're sorry, but we cannot refund the amount for the original shipping cost. Original shipping cost will be deducted off the amount of the product if an item was shipped for free. All returns and exchanges require a Return Authorization (RA) number to be issued. Contact us to receive an RA number prior to returning any items. Items without RA numbers will not be accepted for return. We cannot give refunds for items lost or damaged during the return shipping. Please send your items back via insured methods such as UPS ground or Fedex. Any return initiated by the customer that is not defective or an incorrect product is subject to a restocking fee. Electrical items are not returnable once they have been installed unless the item is under warranty. All warranties are subject to factory approval. If you wish to return or exchange your product, simply contact us. We will do our best to answer your questions and resolve the situation as fast as possible. Patriot Supply reserves the right to cancel any orders for products in which either the items are no longer available or discontinued. On items in which the pricing was listed incorrectly online due to an error, Patriot Supply will contact the customer with the corrected price. Patriot Supply will NOT honor orders at the incorrect "error" prices. Our website is set up to process credit card orders to Canada. We are also now able to take orders worldwide via PayPal payments. No need to call or email just place the order anywhere in the world, pay with PayPal and we will get your order shipped as quickly as possible! Intellidyne - Due to Intellidyne's strict return policy, Any Intellidyne warranty has to pass factory approval before credit can be issued.